The Apology of Socrates features a theatrical solo performance by Emmy Award winner Yannis Simonides (Yale '69, Yale Drama '72) and is directed by Broadway and television veteran Loukas Skipitaris. Oscar and Tony Award winner Theoni Vahliotis Aldredge is the costume designer, with percussive support by Caryn Heilman, a Paul Taylor veteran dancer-musician. The English translations are by Yannis Simonides and Loukas Skipitaris. 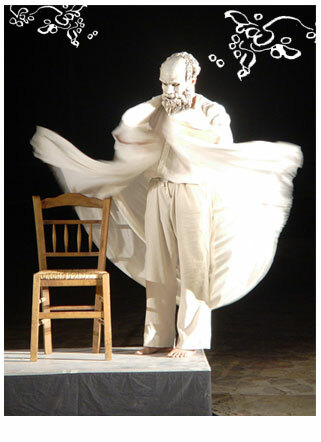 This is a presentation by Elliniko Theatro (www.ellinikotheatro.org) in collaboration with Theatron Inc. The Apology is a delightful and quite humorous dramatization of the famous philosopher's defense while on trial for his life in Athens, ancient Greece. In the Apology, reported to us by Socrates' student, Plato, the wise man of Athens firmly defends himself - rather than apologizing in the contemporary sense - against politically motivated accusations of not believing in the gods of the state and corrupting the Athenian youth.